Menara Pelangi is a freehold condominium located at No. 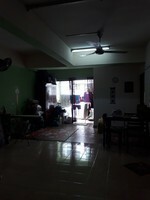 8 Lorong Ang Seng 2, 50470 Brickfields, Kuala Lumpur. It is developed by Grand Central Development and was completed in 2000. Menara Pelangi comes with 2 blocks of 18 storey buildings which comprises a total 280 units. The built-up size of the unit measures approximately from 790 - 946 sf in size and all units come with 3-bedroom and 2-bathroom. Menara Pelangi provides facilities such as covered parking, gym, swimming pool, 24-hour security, playground, launderette and squash court. 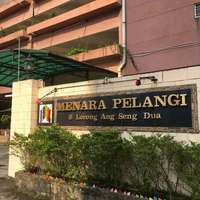 Menara Pelangi is near to amenities such as shopping mall (Mid Valley City and The Garden), public transportation (Bangsar LRT station and KTM) and schools (SMK Vivekananda, SK St Teresa, SJKT Vivekananda KL, Global Indian International School - GIIS, Primary campus, Havil International School, Sekolah Menengah Kuen Cheng and SK Brickfields 1). Accessible via major roads like Jalan Tun Sambathan and Jalan Trevors, and exiting via Jalan Bangsar, Menara Pelangi is sandwiched between other high-rise apartments like Sri Impian Condo and Pearl Court. Get me good deal if there is any units available in Menara Pelangi.